Check out Tobi's Gia Floral Print Cold Shoulder Dress Tropical print dresses: our fave way to hold on to summer vibes. The Black Gia Floral Print Cold Shoulder Dress is a casual boho staple with its tie front, off shoulder neckline, delicate straps and long flared sleeves. Pair this bell sleeve dress with booties and an oversized cardigan for fall. Tropical print dresses: our fave way to hold on to summer vibes. 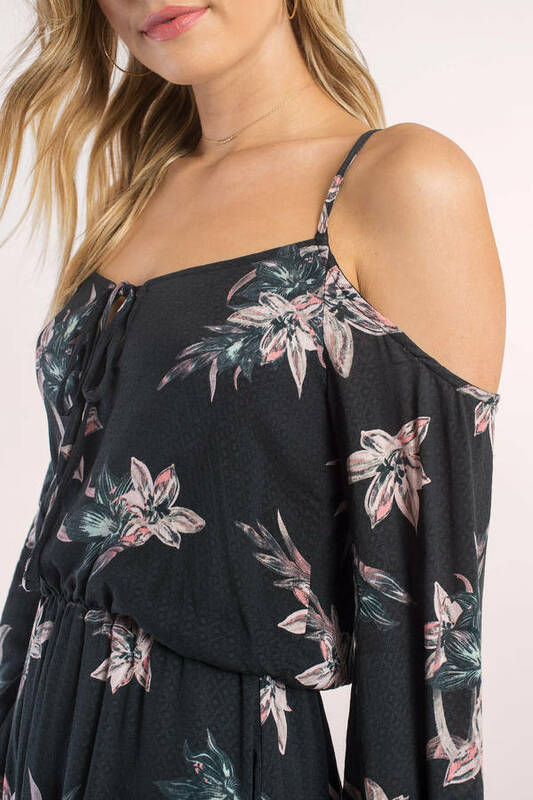 The Black Gia Floral Print Cold Shoulder Dress is a casual boho staple with its tie front, off shoulder neckline, delicate straps and long flared sleeves. Pair this bell sleeve dress with booties and an oversized cardigan for fall.